28nm GCN-based AMD Radeon HD 7000M series continues AMD’s mission to get some more check marks in terms of feature sets and to compete with NVIDIA offerings. This time, it’s called “AMD Enduro Technology” and in brief, it’s a technology that automatically and seamlessly switches graphics adaptors based on application requirements. It can shut down the discrete GPU and bring it back on when needed, similar to what NVIDIA Optimus has to offer. With the introduction of the Graphics Core Next (GCN) architecture, AMD introduced the ZeroCore technology to bring down the long idle (i.e. when screen goes blank) power consumption of a GPU down to 3 Watts even on a “Tahiti” GPU with a die size of 352 mm². The technology also brings the power consumption of idle slave GPUs in a multi-GPU CrossFireX configurations down to less than a Watt, a step closer to completely shutting down those idle GPUs. That’s a remarkable number right there. ZeroCore doesn’t solve the problem once and for all though. With Hybrid CrossFireX/PowerXpress with an APU, or in cases of switchable graphics on an Intel processor with processor graphics (Author’s note: Man, what a tedious name), even with BACON (Author’s note: It’s officially AMD Dynamic Switchable Graphics Technology, but I liked BACON more), you cannot completely shut down the discrete GPU when that is not needed, so that’s 3 Watts for GCN-based GPUs in long idle mode, and that’s the best case. With Enduro, you also save those 3 Watts of power, quite substantial on a modern laptop. Of course, like the competing solutions, the automatic switching and discrete GPU shut down thing is a blessing to Windows 7 (or above) users only. For this kind of MUX-less hybrid graphics system, it’s not even close to the level of “useful” on X server for Linux users. Manual switching by restarting X server is still there as indicated by the footnote, but you don’t get the automatic discrete GPU shutdown/power up feature at all. In all, the addition of AMD Enduro technology levels the playing field with NVIDIA’s Optimus, which does automatic GPU switching and turning off the discrete GPU in one go. 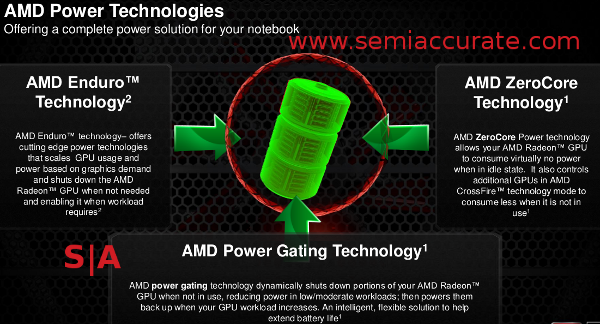 The technology, along with the existing power management and graphics switching technologies should further increase the attractiveness of putting AMD discrete GPUs into notebooks that require performance and power on the go. All this, of course, is Windows 7 (or above) only. Tags: (NYSE:AMD), amd, Enduro, GCN, Radeon HD 7000M, What's with the naming lately?, Windows 7-friendly, Windows 8-friendly?